The package delivery giants usually report similar overriding business trends. It's always interesting to compare the earnings reports of FedEx Corporation (NYSE:FDX) and United Parcel Service (NYSE:UPS). It isn't always easy, though, as they report results halfway in between each other's quarters. In this case, UPS reported at the start of February, while FedEx will give its third-quarter results in mid-March. Let's look at the trends and developments in UPS's fourth-quarter earnings and what they mean to FedEx. 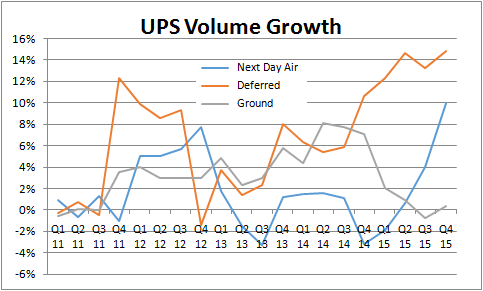 UPS reported weaker-than-expected ground volumes, but its more expensive air volumes increased better than expected. The ongoing theme of residential deliveries grew more than commercial. Pricing affected volume and revenue. Starting with ground volumes versus air, UPS reported just 0.4% growth in U.S. domestic package ground volume in the fourth quarter. However, its more expensive air-based deliveries, as well as deferred and next-day-air deliveries, grew volumes 14.8% and 10%, respectively. Chief Commercial Officer Alan Gershernhorn disclosed that "air volume was well above our expectations," while ground was "a little bit below our estimates." The contrast between next-day-air and ground and deferred matters, because it could signal the beginning of a shift in customer behavior that would benefit FedEx Express services. In previous years, UPS and FedEx customers have increasingly shifted toward cheaper, less time-sensitive options such as ground and deferred. For context, average revenue per piece for UPS next-day air in 2015 was $19.66, compared with $11.70 for deferred and $7.98 for ground. The following chart shows ground volume growth has slowed in 2015 and next-day-air has increased recently. Will the trend continue? DATA SOURCE: COMPANY PRESENTATIONS. DATA IS FROM U.S. DOMESTIC PACKAGE SEGMENT. If it does, it will be good news for FedEx. Express deliveries are FedEx's traditional strength, and 10 years ago they accounted for more than twice the operating income of its ground segment, whereas in 2015 it was only 10% more. Investing conclusion: A shift in preference to faster, more expensive delivery options would favor FedEx. It's no secret that growth in U.S. industrial production turned negative at the end of 2015 -- not usually good news for transportation companies -- but UPS management argued that growth from e-commerce and residential deliveries more than offset any weakness in commercial deliveries. UPS CFO Richard Peretz disclosed that business-to-consumer deliveries grew twice as much than business-to-business, and "in December more than 60% of our deliveries were to consumers." Investing conclusion: Despite clear evidence of a slowdown in industrial conditions, FedEx can benefit from increasing residential and e-commerce deliveries. Like FedEx, UPS chose to implement wide-scale adoption of dimensional weight pricing (packages are priced by dimension as well as weight) and implement pricing strategies designed to smooth out peak demand and optimize profitability. The good news from UPS's fourth quarter is that the measures appear to be working. For example, UPS's ground volume grew just 0.4% in the fourth quarter, but despite lower fuel surcharges, average revenue per piece grew 1.5%. The result was a 2% increase in revenue for ground. Ultimately, UPS's U.S. domestic package segment (ground contributes 71% of the segment's revenue) grew adjusted operating income profit by 18.4% in the fourth quarter -- a sign that the kind of adjustments to pricing that UPS is doing is working. Investing conclusion: If UPS's is generating revenue growth and margin expansion with its dimensional weight pricing and pricing strategy then FedEx can do the same with its similar initiatives. All told, UPS's results augur well for FedEx Corporation. Customer preferences that are shifting to faster, more expensive delivery options would benefit FedEx, and both companies' pricing strategies -- although somewhat masked by the impact on pricing of lower fuel surcharges -- appear to be working. The one area of concern is FedEx's reliance on the consumer for growth. History suggests that a prolonged period of industrial weakness usually leads into consumer difficulties, so investors will be hoping the industrial sector will bounce back later in 2016. Aside from the macroeconomic issue, UPS's results suggest FedEx will do well in its current quarter.